When reporters came to Guant¡namo, everyone always wanted to talk to the Muslim chaplain. I told them the things the command expected me to say. We give the detainees a Qur’an. We announce the prayer five times a day. We serve halal food. Everything I said had been true. But it certainly wasn’t the full story. James Yee, an ex-army chaplain at Guant¡namo Bay prison camp, will speak at Campbell Hall on April 23. Yee is an interesting cultural hodgepodge: A third-generation Chinese-American graduate of West Point, he converted to Islam in 1990. His faith deepened during service in Saudi Arabia after the first Gulf War, and eventually he left the military to dedicate himself to Islam full time. In the years between his resignation and 9/11, he lived in Damascus, where he studied the Qur’an, married a Palestinian woman, and had a daughter. After 9/11, he was persuaded to rejoin the military as a Muslim chaplain. 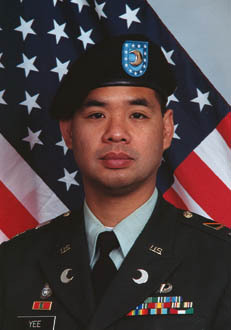 Yee believed he could have a positive influence on the military’s handling of Islam in the midst of the war on terror. Yet after arriving at Guant¡namo in March 2002, he was subjected to an increasingly palpable atmosphere of mistrust and alienation-guards took to yelling “chaplain on the block” whenever he visited the detainees in their holding cells. This suspicion eventually hardened into accusations of betrayal: In September 2003, Yee was arrested and charged with mutiny, aiding the enemy, and espionage, each offense punishable by death. In For God and Country, Yee describes his short stay at Guant¡namo, the besmirching of his reputation by both the military and the press (when the charges were made public, headlines around the world blared, “Al Qaeda Infiltrator at Guant¡namo”), and his hard-won battle to clear his name. The bad behaviors Yee documents extend from his own shameful treatment-the charges against him were quietly dropped after it became clear there was virtually no evidence to support them-to the daily mistreatment he witnessed and catalogued in his time in the cell blocks. While reading For God and Country, it quickly becomes apparent the primary cause of Yee’s troubles was his repeated intervention in instances of detainee abuse. Reports of torture at Guant¡namo-detainees being beaten, chained in “stress positions” for hours, and subjected to extremes of heat and cold and to various forms of psychological abuse-have been widespread. But nowhere has the sectarian nature of much of the abuse been described with such clarity. To cite just one of Yee’s examples, each detainee was provided with a Qur’an, which guards regularly mistreated (Yee recounts an instance in which a guard threw a Qur’an on the ground and stomped on it). When the detainees refused to accept their own holy book in protest, the Guant¡namo command instituted a frightening and bizarre policy: Chanting in unison, a group of eight or more guards wearing black masks and riot gear would rush into the recalcitrant prisoner’s cell, “drench him in pepper spray,” and beat him into submission. The prisoner would then be held in solitary confinement until he accepted a Qur’an. Rife with examples of systematic cruelty, bad faith, poor judgment, and plain ineptitude on the part of the U.S. military officials who oversaw Guant¡namo, For God and Country should be read by anyone who believes the Bush administration when it professes its faith in, and fidelity to, human rights. Such promises are politically necessary because the administration has gone above and beyond the law in its effort to prosecute the potentially endless “war on terror.” Yee’s book is not only a plea for an immediate reversal of policy at Guant¡namo, it is also a reminder. The Bush administration has played on our fears to justify its abandonment of human rights, and the razor-wire architecture of Guant¡namo-still standing after five years-is proof that we bought its counsel. James Yee speaks at UCSB’s Campbell Hall on Monday, April 23 at 8 p.m. The event is free, and copies of Yee’s book will be available for purchase and signing.